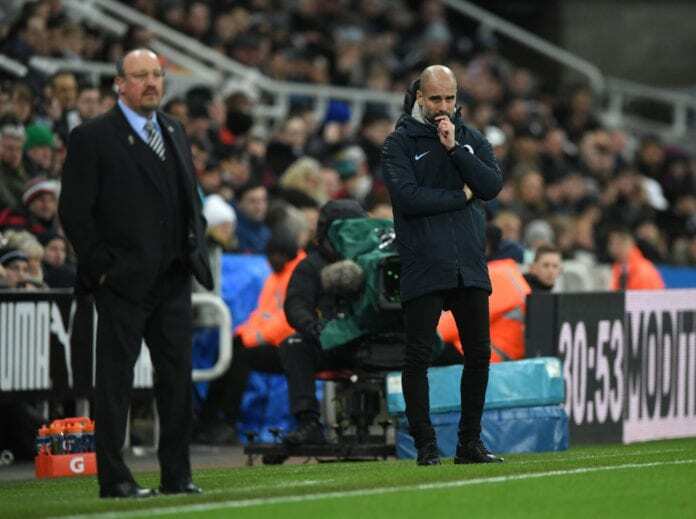 After the shocking defeat against Newcastle on Tuesday, Pep Guardiola lamented the lack of rhythm that the Manchester City players had at St. James’ Park. Manchester City and Pep Guardiola were incredibly excited about this new opportunity to stay behind Liverpool when they visited Newcastle United, St. James’ Park was filled with all the Magpies fans for this crucial match as Rafael Benitez was hoping to keep the squad away from the relegation area. A victory against Pep Guardiola’s Citizens would be tremendous for the club as they hadn’t won a match against them since 2005, the Spanish manager himself would defeat Pep on his 100th Premier League match as a manager, just like he did against Jose Mourinho when the Portuguese boss was coaching Chelsea a little over 12 years ago. Pep’s boys started the match with very little problems as Sergio Agüero scored an early goal against the Magpies, but Salomon Rondon and Matt Richie turned the game around during the second half after the referee disallowed a goal for the Citizens. After this shocking defeat, Pep Guardiola refused to use any excuses and accepted the defeat despite it basically means that they left Liverpool with the chance of moving seven points past them if they beat Leicester City at Anfield Road on Wednesday. “It wasn’t our best,” he told BT Sport via Four Four Two after the match at St. James’ Park. PEP 💬 Our game was slow, we didn’t commit. They shoot for the first time and it’s a goal, the second was a penalty. But congratulations to Newcastle. All the hard work that Pep Guardiola and his technical staff put into defeating Liverpool a few weeks ago just went down the drain, Pep previously stated that if they lost that match they would be saying goodbye to the title race. Losing this Tuesday against Rafa Benitez’s squad is practically the same as losing that game against the Reds, but Pep was smart enough to talk about Manchester City having a small margin of error before this match and they just lost any more chances of messing up again if Liverpool wins this Wednesday. All eyes will be set on Anfield Road for the Foxes’ visit to Jürgen Klopp’s side, the pressure for the local squad will be even greater than if Manchester City had won this match because of how massive the history weighs on the club. This is the moment of truth for the Reds, and one hell of a missed opportunity that Pep Guardiola knows his team just let escape. A victory for Liverpool could signify a whole different season for every single Premier League squad in the competition because everybody will be after the Reds now that they are the top title contender for sure. What result do you expect from Liverpool on Wednesday against Leicester City? Please share your opinion in the comment section down below.